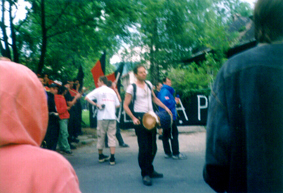 Introduction: Four camps in 2002 It was proposed at the noborder meeting in Poznan that each of the four camps anti-racist border camps planned for 2000 concentrate on one aspect of the border regime and provide some background on it for a common web site (a first simplistic draft of which you are looking at presently at www.noborder.org).The German camp could concentrate on the involvement of the local population in the person-hunts at the border, as apparently denounciations lead to more arrests than the highest technological gimmicks used by the border patrols. The Polish camp will look into the consequences of the border regime at the Polish-Ukrainian-Slovakian border, and especially on the suit-case economy that has become vital for people on both sides of the border and is being combatted along with immigration. Since nobody from Italy was present at the noborder meeting, we could not discuss a possible focus for that camp, but the special situation of the Straight of Otranto (which it shares with the Spanish coast) with its thousands of people drowning every year come to mind. At the Mexican camp, it is likely that the focus will be on the special situation of Tijuana, a million-people city that didn't exist before the border was there, i.e., before the US conquest of California, a city therefore linked in all its aspects to the border. Over 150 people from different countries came: we had people there from Poland, Germany, Ukraine, Belarus, Russia, Slovakia, Holland, Finland, Austria, Bulgaria and Spain. The area has few inhabitants; the entire population of Ustrzyki Gorne was deported after WWII after the UPA (Ukrainian partisan army) became active in the area. There were three main actions. 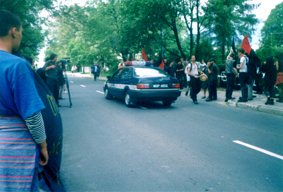 First, there was a demo in front of the border police in Lutowiski (see pictures below) where people shouted slogans and burned a symbolic border crossing. The second action was supposed to be the most important - the illegal crossing of the border. But there were torrential rains and only about 25 of the most enthusiastic and hardy campers decided to make the four hour hike up the mountain trails. Still, when they got there they found out that the border police had been waiting there for 3 days and had to mobilize everyone they had (about 1500 people) to stop us. So, needless to say, nobody managed to cross. Finally, during the last action there was a protest at the building site of a new border guard HQ; people climbed a tower and hung a banner. Some information about the campaign "No one is Illegal". 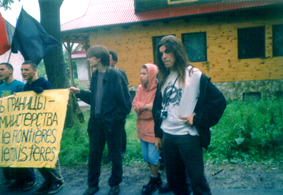 The anti-border camp will take place on 13-19 July 2000 in Ustrzyki Gorne in the Bieszczady region, in the triangle of borders Slovakia, Ukraine, Poland. We don't want to exaggerate with the organising, the intention is to have a spontaneous and cheerful event. The detailed plan will be fixed only for the weekend of 15-16th. On that day we will make an interesting happening on the border. The food will be cooked collectively for money raised from everybody, unless they can't afford it. There will be discussions and lectures about the current direction of policies of Poland and EU in the questions of migration and borders: tightening of control, deportations, asylum right, etc... There will be an exposition about the Lemkowie ethnic group autochtonous of the region, which was one to suffer deportations organised by polish stalinists. 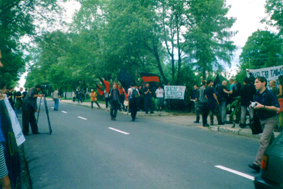 Otherwise, social meetings, parties, attacks on border police, anarchist agitation among tourists and local people. Add your own materials, stickers, posters, leaflets! If somebody is interested, please contact us. Add your ideas, we are all the time open for new things. - coordination of anti-border camps in Poland, Germany,Mexico and Italy. The international 'No borders!' camp on the German-Polish border is provided from 29th of July 'til 6th of August for resistance to EU's border policy. It's not the first year when EU provides money, obtained from your taxes, to polish border services by educating, training and equipping them for their frontiers defence from the eastern neighbours. And from us - among them. - It's already announced that after the short period of time ukrainians will be able to travel to Moldova, Russia and Belarus (which previously were the 'free-go zone') only with external passports. Only 30 % of the population have these passports, that cost half of the average ukrainian salary. Media and official statements hardly connect crossing the borders by people - and, especially, migration - with drugs and weapon smuggling, increase in crime and social problems. One of popular Kiyv newspapers: 'During the last year and half ONLY 369 people have been deported from Ukraine' (meaning the need to deport much more people). Another one places the big interview of the colonel-general Pavlo Shisholin (State Committee of the state border's defence): 'It's easier not to let the uninvited guests to come than to put'em out - about demonstrative border operation 'Frontier-2000' conducted this summer. The word 'migrant' becomes the synonym of 'criminal'. In the EUs countries the ukrainians have been placed to the same category with those ones who are 'contained' by them in their home - immigrants from East and South. The growth of xenophobia and racism are only some of such propagandas poisoning fruits. Building the walls around the Fortress Europe not only indulge more people to avoid hunger, wars, diseases and misery in much more dangerous ways, running the risks of death or deportation to the place where death is waiting for a lot of them. The EUs decisions encourage others to write similar laws in other parts of the world - so-called 'domino effect', and we are not the only who are affected by it. We, the participants of ukrainian initiative 'No borders', have participated in July anti-border camp that took place on the polish-slovakian-ukrainian border. It gave us the opportunity to discuss the european borders strengthening, which we can observe, with another people from Poland, Germany and other countries. But already at that time we knew that we arent able to come to participate in german camp for discuss this question with you personally. The only choice we have now is to address by this text, at least in this way expressing our attitude to this sore point. The black irony of the situation is that we can't discuss personally the people's right for free movement with the other lands inhabitants exactly because of what we are against: the hard border and visa regime. Til now The New Iron Curtain creates 'double standard' towards people's rights, dividing the humanity into those ones whom are under their defence and those who are related to them only from time to time. Unfortunately, it isn't a new story. Let us hope it isn't forever. Open the borders, close the ministries!